I love award season! In my opinion, this is the best time of the year. We’ve watched as critics, the foreign press, and the independent film community hand out awards of excellence for top-notch filmmaking. Now, at last we come to the final showdown in the world of cinema: the Academy Awards. Last year the bar was set high as it was a year of celebrating many overlooked actors, films and film genres; mainly those within the LBGT and African American communities respectively. Sure, there was a small hiccup when Faye Dunaway announced the wrong film. Hopefully, things will be different this year. So many records have been made with just one film, “The Shape Of Water.” It’s amazing how one small budget, Sci-Fi/Fantasy film that contains a metaphorical message about interspecies relationships standing in for interracial relationships in the 1960s, has found its way to the top of the podium . This has been one of the best years for moviegoers in almost a decade. Now, I give you my predictions for the 90th Academy awards. Lets see how close I get with this list. I eerily and without out knowing predicted “La La Land” winning Best Picture, with Moonlight sneaking in at the last minute. So, without further ado, lets see what this year has to offer. Who Will Win: Sam Rockwell. His performance is incredible. Not since Rod Steiger’s performance from “In The Heat of The Night” has there been such a redeemable, angry police officer on screen. Rockwell was overlooked for his performances in “Moon” and “The Way, Way Back.” It’s time for him to get his due. I would also not be surprised if Willem DaFoe snuck in and won like Mark Rylance did two years ago. DaFoe has been so close to winning three times before. If Rockwell doesn’t win like he should, DaFoe might finally get his chance. Who Should Win: Rockwell. He’s so damn likable as the cantankerous Dixon. You don’t want to like him, but watching him grow as a officer contributes greatly to the story within the film. Sam Rockwell is one of our greatest actors working today, and he deserves to be rewarded like Chris Cooper was for 2002’s “Adaptation.” I think that’s the result we can expect from this years "Best Supporting Actor" category. Who Was Robbed/Shouldn’t Be There: I feel like there were so many great performances that were robbed this year. Two of which come from “Get Out.” I’m glad Daniel Kaluuya was nominated for Best Actor. But what about nominating Lil Rel Howery or Lakeith Stanfield? They gave two game-changing performances. Lil Rel was essentially the voice of the audience screaming: "Don’t go in there!" The two most disappointing snubs were Armie Hammer and Michael Stuhlbarg for “Call Me By Your Name.” Stuhlbarg shines in his role as the compassionate father of a young sexually-confused teen living in 1983. Whereas Hammer plays that 25-30 year old man who turns that 18 year old’s world upside down. Timothee Chalamet is getting all the praise, but both Hammer and Stuhlbarg are equally as impressive and this is the role that saved Hammer’s career. As for who shouldn’t be nominated, it’s very clear in my mind. Christopher Plummer. “All The Money In The World” got mixed (leaning towards negative) reviews. The only reason Plummer is nominated is because he filmed his entire role in a week after replacing Kevin Spacey. Yes, it's an impressive feat to record your part in a week, but the performance is sub-par in a ok-ish movie. Plummer already has an Oscar for his role in “The Beginners.” He doesn’t need another nomination when four brilliant actors were overlooked. Who Will Win: Allison Janney. She’s like the J.K Simmons of this years award season. A classic character actress nominated for playing an abusive tyrant; a role for which she will be rewarded. She’s swept everything including the BAFTA, which has a habit of foretelling who will win at the Academy Awards. They predicted Tilda Swinton and Marcia Gay Harden sneaking the award away in years past so I wouldn’t be surprised if a last minute campaign for Lesley Mainville was made for a steal. Even so, I think it’s Janney’s year. Who Should Win: Laurie Metcalf for “Lady Bird.” Yeah it’s easy to play the villain mother like Janney because you get to swear at and belittle people. Metcalf on the other hand played a real mother; one who loves her daughter. Metcalf supports Lady Bird but also balances that support with discipline. This is a real world take on being a mother in 2002. Metcalf is my favorite of the actresses nominated and I’d love to see her be rewarded for this role. Who Was Robbed/Shouldn’t Be There: All these actresses should be nominated. I have no qualms with any of these choices. Still, I wish they added a 6th nominee in Allison Williams for “Get Out.” Her performance was absolutely marvelous and left me awestruck. However, to nominate her, you’d have to bump another in this category and, as I said before, no one should be bumped. Who Will Win: James Ivory. He’s 89 years old and has lost three previous times. This is finally his year. He earned this and what he wrote was a beautiful adaptation of an acclaimed novel. That is what Ivory does best. Who Should Win: Ivory. He’s waited long enough. This is his time. He’s 89. Who knows how many scripts he has left in him. Who Was Robbed/Shouldn’t Be There: I feel like Aaron Sorkin has been nominated so many times. Why nominate him again when you have scripts like “IT” that were adapted from a book which was all but impossible to cut down. If you’re going to nominate a horror movie like “Get Out,” why not nominate “IT” as well? Who Will Win: Martin McDonagh, Jordan Peele, and Greta Gerwig have a three way head-to-head race for best screenplay. McDonagh will probably win because he wasn’t nominated for Director and they’ll want to award him. HOWEVER, Peele won the WGA award which usually predicts the outcome. Even so, McDonagh wrote a very tight and powerful script. So it’ll probably be McDonagh. Who Should Win: Jordan Peele. He won the WGA and he addressed a very serious issue in America in such a unique way. Peele is like a combination of Spike Lee & Mel Brooks. He addresses real world problems, but he does so with humor. Who Was Robbed/Shouldn’t Be There: This is another example of perfect nominations. With that said, I wish Sean Baker & Chris Bergoch were nominated for “The Florida Project.” That was a clever script, but the fact that 50% of the movie was improvised is a huge issue to the Academy. Who Will Win: This is the toughest category for me to pick. I want to say Roger Deakins, because it’s his thirteenth nomination. He’s the world’s greatest cinematographer and he’s never won an Oscar. “Blade Runner 2049” looks gorgeous because of his cinematography. At the same time, Dan Laustsen made “The Shape of Water” shine off the screen. I’m going to say Deakins because he deserves it but I wouldn’t be surprised if Laustsen won. Who Should Win: Both Laustsen and Deakins. There have been ties in the past and I think they both deserve it. They are both legends and amazing cinematographers who have been repeatedly overlooked by the Academy. This is Laustsen first nomination, and Deakin’s 13th. Who Was Robbed/Shouldn’t Be There: They all deserve to be nominated and there’s no way I’m saying that someone named Hoyte Van Hoytema should not be nominated. That name alone is epic! Who Will Win: Really? Is it any surprise? COCO. Who Should Win: COCO. It’s one of the most beautiful films of 2018.
Who Was Robbed/Shouldn’t Be There: You all know how I feel about the “Boss Baby,” so I’m not going to saying anything further about that. I will say “The Lego Batman Movie” deserved a nomination. I don’t know why the Academy hates LEGO so much, but they deserve Oscar love. Who Will Win: Gary Oldman. This is the year of awarding the snubbed actor. Also, he’s won everything else. Who Should Win: Gary Oldman. He’s earned it. However, it would be nice to see Timothee Chalamet or Daniel Kaluuya win as part of this new Hollywood movement the Academy is so keen on. Who Was Robbed/Shouldn’t Be There: Denzel Washington has enough Oscars and nominations to go with it. He didn’t need this nomination and the movie wasn’t very good or groundbreaking. He’s like the Meryl Streep of Best Actors. The one actor who was snubbed hard because of the Weinstein scandal was Jeremy Renner for “Wind River.” Renner gave, in my opinion, one of the best performances of a grieving father I have ever seen. However, due to who distributed the film (Weinstein) no play was made for the award. It’s truly a shame because Jeremy Renner is astonishing in the film. Who Will Win: Frances McDormand. She gave the best performance of the year. Not just when she’s playing a foul-mouthed curmudgeon, but also when her character has her emotional breakdowns. Many people are pinpointing her Oscar winning moment and it’s clear that it's when she has a conversation with a deer at the site of her daughter’s murder. It’s one of the most beautiful moments in the film and it showcases her genius. Who Should Win: McDormand. But Hawkin and Ronan were brilliant. Hawkin had to convey love with no dialog. Now that’s hard to do. I still think McDormand should and will win. Who Was Robbed/Shouldn’t Be There: Meryl Streep doesn’t need another Oscar nomination. The actress who deserved the nomination was Zoe Kazan for “The Big Sick.” She is gone for the second act of the film only to appear later, yet her performance helps us fall in love once again with her character. That’s true acting talent. Who Will Win: Guillermo del Toro, no contest. The way he made a 19.5 million dollar movie look like a 90 million dollar movie was incredible. The pacing was perfect, his movie jumped off the screen, and when you think of what directing for a film requires... this is the movie people should look to. There is a chance they could reward first time directors Peele or Gerwig, but del Toro has won the DGA, the Golden Globe, and the BAFTA. 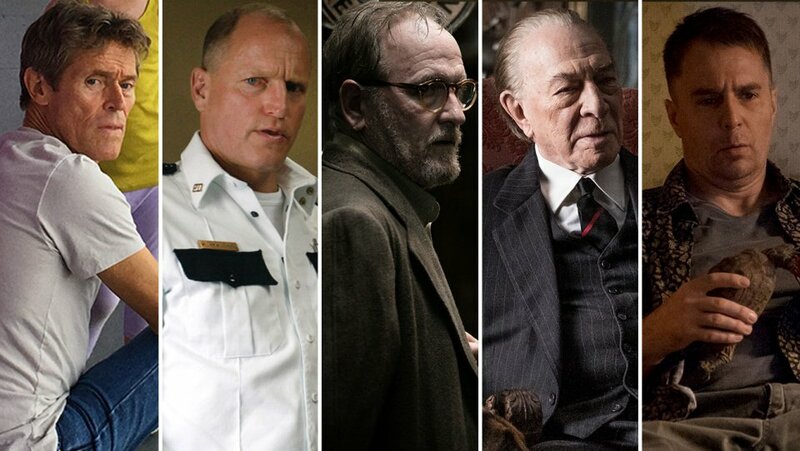 Who Was Robbed/Shouldn’t Be There: Martin McDonagh should have been nominated this was a very good year for directing. All five should have been nominated though I still think McDonagh deserved the nomination. Who Will Win: It’s a dead heat between “Three Billboards” and “The Shape of Water.” I predict it’ll be a photo finish, especially since “The Shape of Water” won both the PGA (Producer’s Guild Award) and the Critic’s Choice. That is usually an indicator. BUT “Three Billboards” won the BAFTA, The Golden Globe, and the SAG. After watching both films back-to-back this weekend, I’m going to lean towards “Three Billboards Outside Ebbing, Missouri.” The film is perfect. It’s the right amount of humor and sorrow; action and heart. The subject of justice for victims of sexual assault is also very topical, and that will undoubtedly play a huge role come voting time. “Three Billboards” is the safe bet, but don’t be shocked if “The Shape of Water” wins. Crazier things have happened. Who Should Win: I’m torn. I want “Three Billboards” to win, but I also think “The Shape of Water” deserves it too. This is a pickle. I think if del Toro wins best director, “Three Billboards Outside Ebbing, Missouri” will win best picture. Who Was Robbed/Shouldn’t Be There: I’m going to get on my soap box for a moment. The Academy has ten spots that they can choose to fill with ten nominees. I feel that the nine nominated deserve to be there. I truly do. But why only nominate nine movies when you have ten spots? Films like “The Big Sick,” “The Florida Project,” or even “Logan” and “COCO” deserve that tenth spot. For the last six years, they’ve nominated between 7-9 choices a year; wasting between 3-1 spot. Even if those other films aren’t going to win, they should still be given a chance. The 90th Academy Awards will be airing Sunday March 4th at 8PM on ABC with Host Jimmy Kimmel.